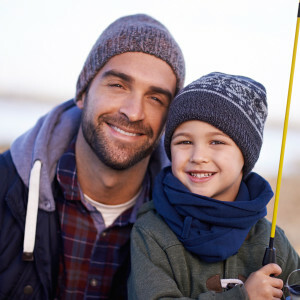 Designating a beneficiary is a choice you must make and revisit throughout your career. This decision requires some careful thought. If you die while working, the beneficiaries you choose may receive certain benefits. If you want to make a beneficiary change, make sure you’re aware of who can be named as your beneficiary. There are two types of beneficiaries you can name: primary and contingent. A primary beneficiary receives your death benefit. You have the option to name more than one primary beneficiary. If you chose to do this, each primary would share the benefit equally. A contingent beneficiary only receives a benefit if all your primaries die before you. You can have primary and contingent beneficiaries, but a contingent may only get a benefit if there are no primaries to choose from. If you outlive your primary and contingent beneficiaries and haven’t named anyone new, your benefit will go to your estate. Your beneficiary doesn’t have to be a person – you could also name your estate, trust, or an organization to receive your benefit. Estate. The executor of your estate will receive your benefit to be distributed according to your will. You can make your estate a primary or contingent beneficiary, but if you name it your primary, you can’t name a contingent. Organizations. You can name any charitable, civic, religious, educational or health-related entity as a beneficiary. Please provide the organization’s full name and address if you name them a beneficiary. You can read more about beneficiaries in our publication, Life Changes: Why Should I Designate a Beneficiary? Content last revised November 20, 2015. This entry was posted in General News, Members and tagged beneficiary, benefits, Choosing a Beneficiary, contingent beneficiaries, defined benefit plan, Designating a beneficiary, ERS, estate, Information is the Key, know your benefits, members, New Members, New York State & Local Retirement System, NYSLRS Retirees, PFRS, primary & contingent, primary beneficiaries, retirement plan, retirement planning, trust, will, Your beneficiary doesn’t have to be a person on September 23, 2015 by NYSLRS. Becoming familiar with your finances is an essential part of retirement planning. By understanding how you spend, save, or invest your money, you can plan ahead and work for the type of lifestyle you want in retirement. Once you’ve retired, you can continue to check your saving and spending to keep making good financial decisions for the future. One important step you can take is to figure out your net worth. Your net worth shows your current financial status, like reading a report card for your finances. You can see where you’re doing well or where you can improve. Once you have that information, you can get a head start on retirement planning. “Worth” Noting: According to the Wall Street Journal, in 2010, the average net worth per person in America was $182,000. By comparison, according to Forbes, the net worth of Microsoft’s co-founder Bill Gates was $76.8 billion as of August 27, 2015. Total liabilities are money that you owe. If you still owe money on a mortgage, credit cards, or loans, these all add up to your liabilities. (This net worth article from the Wall Street Journal has other assets and liabilities to consider.) If your total liabilities (what you owe) equal more than your total assets (what you own), you’d have a negative net worth. Your net worth will change over the course of your life. A negative net worth might not mean you’re in financial trouble, it just means at that moment in time you have more debts than assets. This means you’d need to start thinking of ways to increase your assets and/or lower your liabilities to work with your financial goals. If you make a habit of checking your net worth, you can start seeing how financially secure you are (and could become) as you plan for retirement. This entry was posted in General News, Members and tagged Bill Gates, ERS, financial goals, financial literacy, Information is the Key, members, net worth, net worth = total assets – total liabilities, New York State & Local Retirement System, NYSLRS, personal savings, Personal Savings Plan, PFRS, plan for retirement, Preparing to Retire, retirement, retirement plan, retirement planning, retirement security, total assets, total liabilities on September 9, 2015 by NYSLRS. A NYSLRS pension benefit can provide security and peace of mind in retirement. What some retirees might not realize about their lifetime benefit is the effect it has on the local economy. During 2014 alone, NYSLRS retirees were responsible for $12 billion in economic activity in New York State. By buying local goods and services, NYSLRS retirees help existing companies grow, create opportunities for new businesses, and help foster an environment that helps companies create job opportunities. Retiree Spending Creates Jobs, Supports Local Business. NYSLRS retirees spend a larger than average share of their income on industries that benefitted local businesses, such as health care, restaurants and entertainment. These industries can expect more growth in the coming decades with NYSLRS retirees as part of their customer base. As a result of this spending, NYSLRS retirees were also responsible for an estimated 60,400 jobs. Retirees Pay Billions in Taxes. In 2014, NYSLRS retirees paid $1.6 billion in real property taxes, which is five percent of the total collected in New York. These taxes help support New York schools, roads and government services. 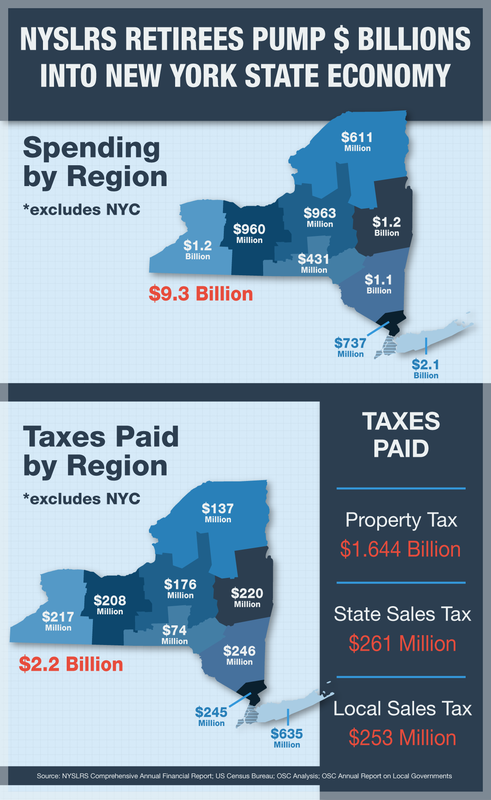 Also, spending by NYSLRS retirees and beneficiaries generated an estimated $514 million in state and local sales tax. After spending their careers working in State and local governments, the university system, public authorities and schools, NYSLRS retirees continue to help New York’s Main Streets grow and develop. The benefits of a NYSLRS pension aren’t just felt by retirees, but also by local businesses and communities. As the number of NYSLRS retirees continues to grow, the investment they make in communities across New York State will also continue to grow. Content last revised September 23, 2015. This entry was posted in General News, NYSLRS Retirees, Retirees and tagged beneficiary, Economic Stimulus, ERS, Information is the Key, New York State & Local Retirement System, NYSLRS, NYSLRS pension, NYSLRS Retirees, One of America's Largest Pension Systems, PFRS, public pension system, Retirees & Local Sales Taxes, Retirees & Property Taxes, Retirees & State Sales Taxes, Retirees Contribute, Retirees Create Jobs, retirees pay taxes, retirees spending, Strength Through Strategy, Strong New York, this public pension system works on September 2, 2015 by NYSLRS.